Newsday See where Lonzo Ball, Markelle Fultz and other top prospects end up in Newsday's NBA mock draft 5.0. Sixers fans excitedly hoisting their "Trust The Process" signs are my favorite fans. Lonzo Ball to the Lakers at No. 2. I don't want to hear about his shooting form or his father's brashness. The kid can flat-out play -- offensively, at least. He will be a ton of fun to watch with NBA space to make plays, using his court vision and elite passing ability. And, yes, his form is quirky, but his shot goes in from well beyond the NBA line. He shot 41.2 percent from deep at UCLA. Maybe the defense will come. If it doesn't, Ball will still have a shot at several all-star appearances. It's looking less likely that Jonathan Isaac will be an option for the Knicks at No. 8. The Bulls reportedly traded Jimmy Butler and the No. 16 pick to Minnesota for Kris Dunn, Zach Lavine and the No. 7 pick. They could use a wing. Isaac seems like a solid, logical choice for them at No. 7. The one chance is if they look for a point guard to replace Rajon Rondo after next season. Jayson Tatum to Boston at No. 3. Not much of a surprise here, since Josh Jackson never worked out for the team. Celtics needed a wing, and Tatum was probably a better fit than Jackson from the start. Boston already has Jae Crowder, who can defend but is not much more than a role player on offense. With Tatum, the Celtics have a wing they can build an offense around for the future. Josh Jackson to Phoenix at No. 4, per Woj. I know I'm higher on him than a lot of people, but I wouldn't be surprised to look back on this draft in 10 years and say he was the best player. He and Dennis Smith are the guys who didn't go in the top three who are most likely to get that title, in my opinion. Jackson was a lockdown defender at Kansas. He's a tremendous athlete who can dominate in transition, and his jumper showed steady improvement from non-conference to Big 12 play. Small sample size, but it shot up from 32 percent to 43.5 percent from deep. De'Aaron Fox to Sacramento at No. 5. The Kings needed a point guard, and they got one. Fox has one drawback: he showed no sign of being a three-point shooter in one year at Kentucky, posting a 24.6 percent clip. But he does just about everything else. Good playmaker. Quick and athletic enough to beat NBA guards off the dribble. He's got a wiry frame, but he has deceptive strength, which helped him finish 64.2 percent of his shots at the rim. Perhaps Fox's best attribute is his defense. He locked down Lonzo Ball in the Sweet 16, which is the game everyone will point to, but he was consistent on that end all year. 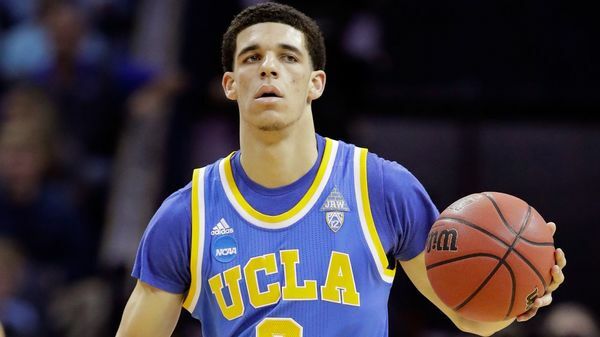 Lonzo says there are currently no plans to make Big Baller Brand more affordable. "We are trying to be a luxury brand." Mixture of cheers and boos for Ntilikina. Whatever it is, they feel VERY STRONGLY about it. Did the Knicks forget about Frédéric Weiss? Phil wouldn't address KP talks. Said tonight is about the player they just don't drafted. The Jazz have sent Trey Lyles and the No. 24 pick to Denver for the No. 13 pick, which they will use on Donovan Mitchell, according to Woj of the Vertical. Solid move. Mitchell is 6-3 but has a 6-10 wingspan, which aids his disruptive ability defensively. He has plus defensive instincts, too, and could be a lockdown defender in the backcourt. Mitchell also has improved offensively, averaging 15.9 points and 2.7 assists per game and shooting 35.4 percent from three as a sophomore after shooting 25 percent as a freshman. Bam Adebayo to Miami at No. 14, which is interesting because of Hassan Whiteside. Both are centers, and Adebayo has shown no signs of being able to play the 4. Miami could have used a scoring wing. Justin Jackson was available. Adebayo was the pick. He's a strong, physical big who has drawn comparisons to Dwight Howard -- mostly from a physical standpoint. Has a chance to be a solid shot blocker and post defender, though he could have been a better rebounder at Kentucky. Offensively, lots of putbacks, lobs and dunks. Adebayo is the third Kentucky player taken in the lottery. Frank Ntilikina on what he brings to the Knicks: "A lot of hope." Assuming the reported trade goes through, Minnesota gets Justin Patton with Chicago's No. 16 pick. Love this pick for the Wolves. Patton, a 7-footer with a 7-3 wingspan, is a perfect fit alongside Karl-Anthony Towns in the frontcourt. He showed some ability to step out and shoot. He can run and finish in the pick and roll, but his efficiency stood out most during his one year playing for Creighton (he redshirted as a true freshman because the staff did not think he was ready for the Big East). Patton shot 68 percent from the field. He averaged 12.9 points and 6.1 rebounds and posted a very solid 5.9 percent block rate. Bigs on board: Anigbogu, Allen, Pasecniks, Hartenstein, Giles, Lydon, Swanigan. At least three will be there for @BrooklynNets . Woj say John Collins, who I thought would go early is No. 19 to Atlanta. OG Anunoby dropping (knee surgery). @BrooklynNets hav big decision. Does John Collins have some defensive shortcomings as a 6-10 big? Sure. But he was an elite rebounder at Wake Forest, ranking eighth nationally in offensive rebounding percentage and 37th in defensive rebounding percentage. He also is super smooth offensively and can score in the post and from the mid-range. He did not shoot many three-pointers at Wake Forest, but his mid-range game and 74.5 percent clip from the foul line indicate he could extend his range. Good fit at No. 19 for the Hawks, who don't have much frontcourt depth. So many question marks around Harry Giles, who the Kings took at No. 20. At one time, Giles was considered the top prospect in the 2016 recruiting class and a candidate for the No. 1 overall pick in 2017. That was true even after he tore his left ACL in 2013. But then he tore his other ACL, which cost him his senior year, and underwent an unrelated arthroscopic surgery before Duke's 2016-17 season tipped off. Giles looked out of place and uncomfortable in the limited action he saw for Duke. Could he re-gain the confidence and explosiveness that made him an elite recruit as a 6-11, athletic big? Maybe. If he does, he will be a steal at No. 20. Still on board with only OKC ahead of @BrooklynNets : Anigbogu, Allen, Hartenstein, Pasecniks, Lydon, Swanigan. Wings: Anunoby, Ferguson. Ferguson to OKC says Woj. They're running out of things to ask these lower first round draft picks. "What type of cheesecake will you eat?" Just shot a quick Facebook Live analysis of the Nets' selection of Jarrett Allen. Tyler Lydon to Denver via Utah at No. 24. Never really proved he was capable of being the go-to guy at Syracuse, but he could be a solid NBA starter as a combo forward with deep range. He shot 40 percent from deep over two years in college. One major question mark is how his defense translates from Syracuse's 2-3 zone to the NBA's man-to-man. Denver doesn't quite have a player with Lydon's skill set, so he will have a chance to crack the rotation right away. Philadelphia has acquired the draft rights to Anzejs Pasecniks from Orlando, who selected the Latvian center at No. 25, per Woj of the Vertical. Rim-runner who has flashed some ability of finishing in the pick and roll. Needs to add strength to his 7-2 frame. Thanks for following along tonight. Enjoy the second round!